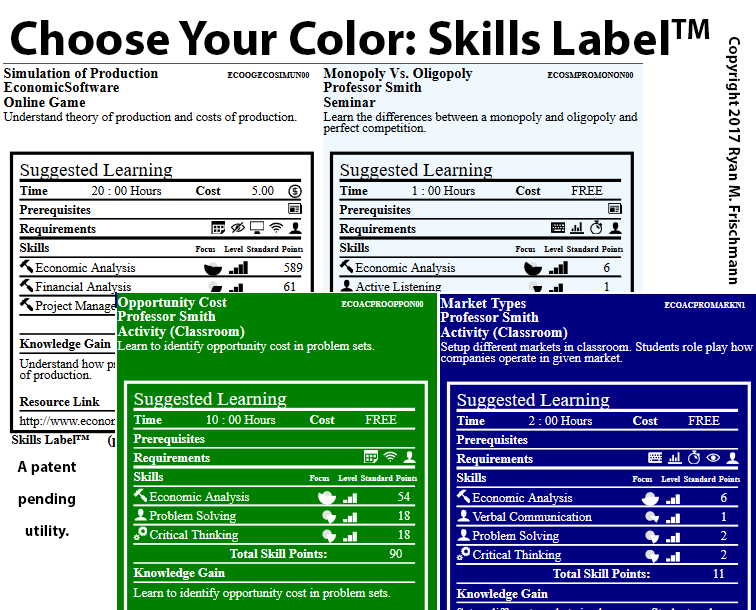 Skills Label ™ is a fresh, patent pending concept: a standardized display and representation of learning for any discrete task. If you think about it, there is no standardized process and display to attribute what has been learned from an education resource. There is no way of comparing traditional learning types – books, classroom courses, with emerging learning types – online games and courses, IoT, etc. Furthermore, there is disarray in comparing education, higher education, and professional learning resources. For a basis of comparison, think about a nutritional label on food. At an early stage (in health class as a kid), we are taught how to read the label and understand the nutritional value of the food. Later in life, as we shop at the local food store, we make instantaneous decisions between types and brands of food based on their labels. Furthermore, the FDA weighs in may issue a stamp of approval. Defining learning in skills and skill competencies has advantages. First, skills are standardized, with universally accepted definitions. (The database of skills for this application is also used with the Skills-Based Approach application.) Second, skills are understood across disciplines; educators, recruiters, employers, and policy makers all understand skills. Third, skills based learning is making headway in education because it is personalized and adaptive to the learner. 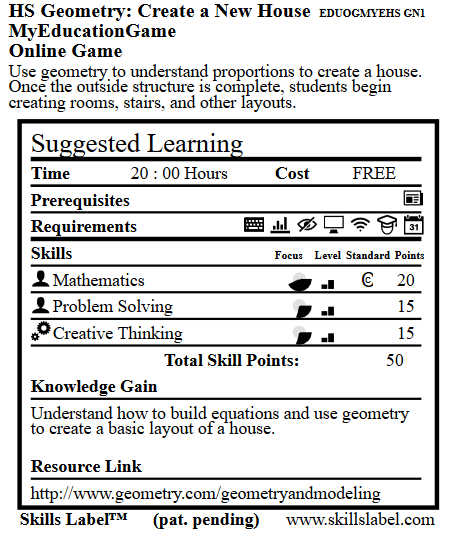 Common Core is largely based on skills and is built into the interface of the label, both in the wizard interface and on the display. College and universities are introducing competency based learning programs. Finally, skills work with traditional and emerging learning technologies and applications. You can define learning skills in not only traditional courses and activities, but also online games and courses. Skills Label ™ involves: defining what is learned from a resource using an interactive interface, designating a credential gained after consuming the resource, and making the resource accessible to an audience. The result is a standardized display. Something (I hope) becomes recognizable as a basis of comparison of learning resources. I am skeptical the current movement to offer choice in schools has its desired effect: improve equity in standard education. But, I hope access to the learning resources becomes equitable (if not in the classroom, then out of the classroom). This is something we are already experiencing with the free, online distribution of courses (like Khan Academy in education and Courera or EdX in higher education). Students should be able to choose learning resources based on their own learning preferences and ROI. Skills Label™ is an ideal platform to make comparisons between learning resources. Please join the community: follow on Twitter at http://www.twitter.com/skillslabel and signup on the website http://www.skillslabel.com .